LFG Policy Director, Cris Coffin, was among the six experts convened by the House Agriculture Committee’s Subcommittee on Biotechnology, Horticulture, and Research to testify on February 2, 2016 about the benefits and challenges of direct marketing. As a farmer who directly markets pastured poultry and an advisor to Farm to Institution New England, Cris was among the farmers, ranchers, and ag-vocates that shared their experiences and insights about connecting directly to consumers and other local food strategies. The National Sustainable Agriculture Coalition and Farmers Market Coalition helped identify witnesses for the hearing. The hearing emphasized the important role of direct marketing in agriculture and identified federal programs that are important to farmers and ranchers engaged in this growing marketing channel. Cris emphasized that direct marketing is especially important to New England agriculture. She also noted that the aging of New England’s farmers presents both a challenge and opportunity for farmers seeking to start or grow direct sales. According to recently released research by American Farmland Trust and LFG, 30 percent of New England farmers are age 65 and older, and the 1.4 million acres of land they own are likely to transfer in the next two decades. She emphasized the need for strategic investments and policy changes to help facilitate this transition in a way that keeps farmland in farming, and offers security for exiting farmers and opportunity for next generation farmers. For example, the Beginning and Rancher Development Farmer Program (BFRDP) has funded land access projects across the country, including LFG’s regional Land Access Project. Cris underscored the importance of making a personal connection with consumers. “The value of direct marketing to consumer education is especially important where farms are surrounded by non farming neighbors,” Cris explained in her testimony. “Every direct sale is an opportunity to educate a neighbor and consumer about farming, building support for agriculture.” Read Cris’ full testimony or watch video of the public hearing here. 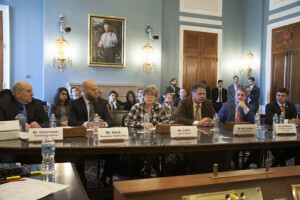 Read more about the hearing on the National Sustainable Agriculture Coalition blog.